Did you know that having any variation in your business information online could have a significantly negative impact on your search engine rankings? 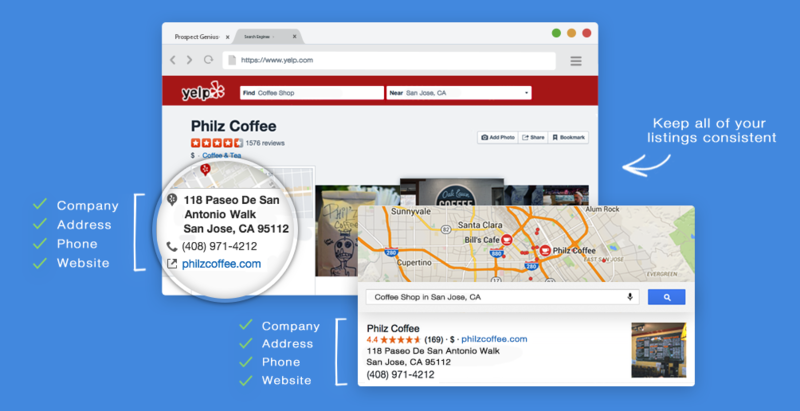 Being associated with multiple different phone numbers, addresses, and company name variations could cause your rankings to plummet. That’s why it’s extremely important to keep your business information consistent all across the internet. But what if it turns out that you have a problem with too many inconsistencies? You don’t want your local search rankings to sink, but what are you supposed to do? Are you supposed to sift through countless pages of web content to find each and every instance where your company information appears? No one has time for that. No one except for Prospect Genius, that is. We’ll run a WebFax® report on your company to determine exactly what needs to be fixed. Then, we’ll take action with the CleanSlate program to resolve all of the issues found on your report. There’s no magic in our CleanSlate program—just good old-fashioned hard work. We have the resources and expertise to hunt down your incorrect information and, when necessary, to contact site owners and have them correct your information for us. There’s a surprising amount of patience and attention to detail involved in the process of cleaning up your web presence, but doing the job right the first time is always worth it.